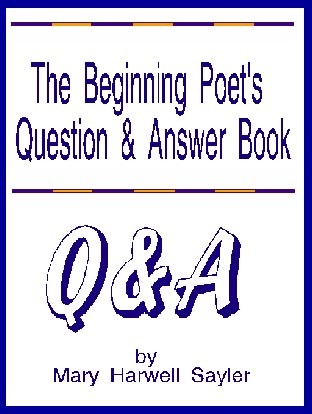 The Beginning Poet's Q&A Book brings together a collection of lively but instructive articles, poetry columns, glossary of poetic terms, and responses to students that Mary Harwell Sayler has written over the last two decades in helping other poets improve the quality of their poems. For an in-depth study of the traditional and contemporary techniques needed to guide the revision progress, her newly revised correspondence course, Poetry Writing 1-0n-1, will soon be available as an e-book published by RSVP Press. Supports Windows 95/98 and ME. If you’re interested in writing poetry (as reading this suggests you are), I suspect you’re a "natural." Most likely, you have a poetic eye or ear or both, depending on whether you’re visually oriented or musically inclined. With adequate practice, this gift alone will enable you to write poetry well – if you give yourself and your writing the time you both deserve. If you also read and study the works of other poets, you will greatly accelerate the professional development and quality of your own poems – a phenomena that occurs for several reasons: (1. )Through study, you’ll discover more about the techniques you’ve been using instinctively. (2.) Then, as you recognize the names and rationale for your poetic devices, you will be able to use them on purpose and with increasing skill. (3.) As you read poetry out loud – your own and someone else’s – you’ll attune your ear to those subtle echoes of sound or nuances of meaning that often escape the eye. (4.) You’ll also escape the need to reinvent the wheel that turns verse (a word which means "to turn") from one line, one "school," or one historical moment to another. The more you learn, however, the more you’ll see there’s no stopping now! Knowing how to write memorable poems – poems of excellence – is a life-long endeavor. Yet a minimal investment of time can offer immediate results. How you go about this depends on individual preferences appropriate to your daily routines. As you look at yours realistically, remember this isn’t like other types of writing where you need larger blocks of time. For poetry, think small! If, for instance, you have a half-hour commute to a job, a poetry tape can help you productively pass the time while familiarizing you with classical or modern poems and also providing you with the opportunity to discover favorite poets and mentors. For poetry writing practice, a coffee break, a subway ride, a gap between appointments, or a child’s naptime may be able to give you at least a few minutes each day to write or revise. What you’ll write and how you’ll go about it takes a bit more time to discuss, but that’s the purpose of this book: to provide some information and answers to the questions you’re already wondering about or will want to know soon. Of course, one question you may have from the start is, "Who is this person who’s talking to me, and what does she know about poetry?" – a fair question, and one I’d want answered if I were you, which, in a way, I am. We’re both poets, so that gives us something in common, and like you, I take my work seriously. Correction: I take my work seriously now. Although I began writing poems when I was about nine years old, most of my writing as an adult concerned everything but poetry! In 1972, I began placing nonfiction articles and children’s stories in parenting magazines and church take-home papers, and, as my three children became older, so did my intended readers. I wrote several children’s novels and activity books, then a few romance novels and a series of devotional books – the latter of which included a contract requiring seven 180-page books within a fourteen-month deadline. Somehow the work got done, but after completing the series, I found it a pain in the neck (literally) to sit at a computer. Recuperating with pencil and paper on my front porch, I wrote enough poems to fill a few college rule notebooks. The more I wrote, the more I wanted help with the poetry techniques I’d been discovering on my own. Although I had researched extensively before writing a poetry correspondence course and had instructed poetry students since the early 1980’s, my own poems didn’t progress very far during that time. Lack of practice prolonged my lingering at the same level, but so did the fact that most of the poems I read were written by novices, including me. Although I’d sold several poems and placed one or two in competitions, I had no connection with contemporary poets nor any sense of the flow of poetry throughout history. To remedy this situation and find out all I could about my work and where it fit, I ordered so many books of poems and essays on poetry that the mail-order house began sending me an annual Christmas present! At first, I bought every title that caught my eye. Then I tried to be more discriminating as I focused my study on anthologies and the collected works of Pulitzer or other prize-winning poets. What I soon saw was this: Many "schools" and conflicting concepts of poetry exist – each with an interesting view worth checking into but none worth the chafing that labels often bring. Therefore, in this book, I’ll try to put those diverse perspectives into perspective as the occasion arises, but mostly, I’ll just talk about what works for me and for the students with whom I’ve had contact over the years. Since many students have similar questions, I’ve answered in a Q&A style that provided the format for my poetry column with WE. Several previously published articles and portions of earlier poetry discussions (on cassette or at workshops), reappear in these pages too. So as you read, I hope you’ll think of this book as a mini-workshop with topical discussions followed by Question & Answer Sessions. It’s as close as I can make it to a private poetry-writing conference, intended just for you. A freelance and assignment writer since 1972, Mary Harwell Sayler has written several novels for children and adults, a series of devotional books, activity books, a picture book, and over a thousand short pieces, including many poems and articles on poetry writing. An occasional workshop leader at writing conferences and a frequent poetry columnist and competition judge, Mary works one on one with poets through critiques or her correspondence course.